The Elite 326 C is one of six SunCatcher Elite Series™ models in three lengths offered for 2014 by G3 Boats of Lebanon, Missouri, a Yamaha Marine Company. 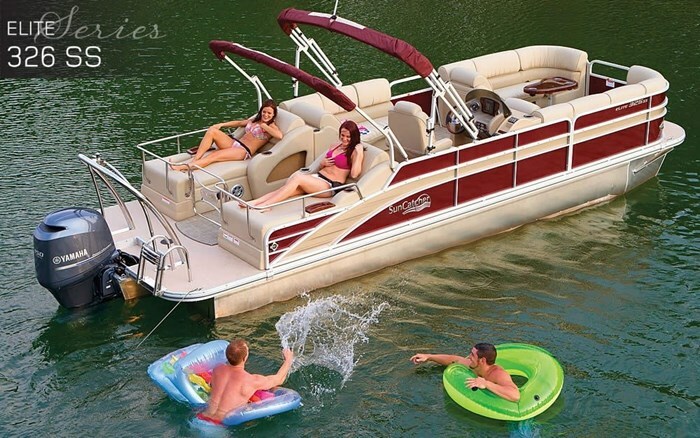 These six Elite Series models are part of a total of thirty-four models of pontoon boats for 2014 in three series which range from sixteen to over twenty-six feet in length. G3 also offers close to one hundred model variations of all-welded or riveted aluminum deep-V, mod-V, fishing, sport, Jon, and utility boats. Three of the six Elite models have “326” in the model designation; the “3” indicating that three logs are standard equipment and the “26” referring to the approximate length of the model - in this case one inch shy of twenty-six and a half feet. By way of clarification, the two other “326” models, the Elite 326 SS and Elite 326 DLX SS are distinguished from this Elite 326 C in that those two models both have two rear-facing stretch-out aft lounges with a centre aft gate and a larger rear swim deck. The Elite 326 C fills this aft space with a raised double-wide sunlounge which is referred to as the SunCatcher Tanning Deck. The aft entry gate is on the starboard stern side. One of the most noticeable features of the Elite Series from SunCatcher is the phenomenal complement of standard equipment included with the boat – equipment that most often would be considered optional extras on other brands and models. For instance, as in all SunCatcher model designations, if it begins with the number “3”, it means that three logs are standard equipment. But it’s not just the addition of a third log, but the fact that all three logs then become Performance Logs with closed cell foam flotation, double-plated nosecones, performance full-length lifting strakes, and a full-length under deck performance shield. 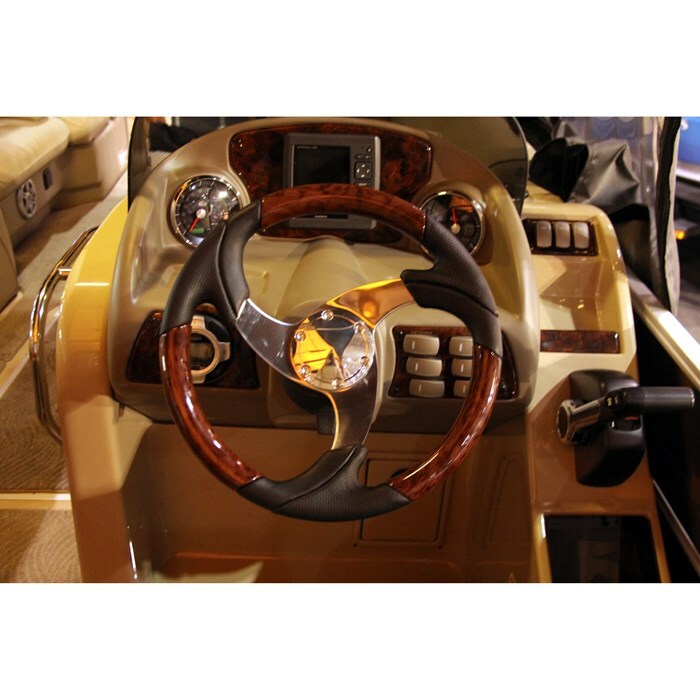 What this third log and the performance additions to them add to the boat is reflected in the fact that the maximum allowable horsepower is increased dramatically – in the case of the Elite 326 C, up to 250 horsepower, plus an increase in maximum allowable carrying capacity – in this case up to fifteen persons, more people than you’d probably ever normally want to have on board. In a fairly recent factory water test of an Elite 326 SS, if anything slightly heavier than an Elite 326 C, but in other aspects virtually identical, with two persons on board and powered with a less than maximum allowable Yamaha 225 horsepower four stroke, optimum cruising speed was found to be a very respectable 24.3 mph at 3500 RPM while consuming 8.0 (US) gallons per hour. Wide open throttle showed better than 44 mph at 5900 RPM. 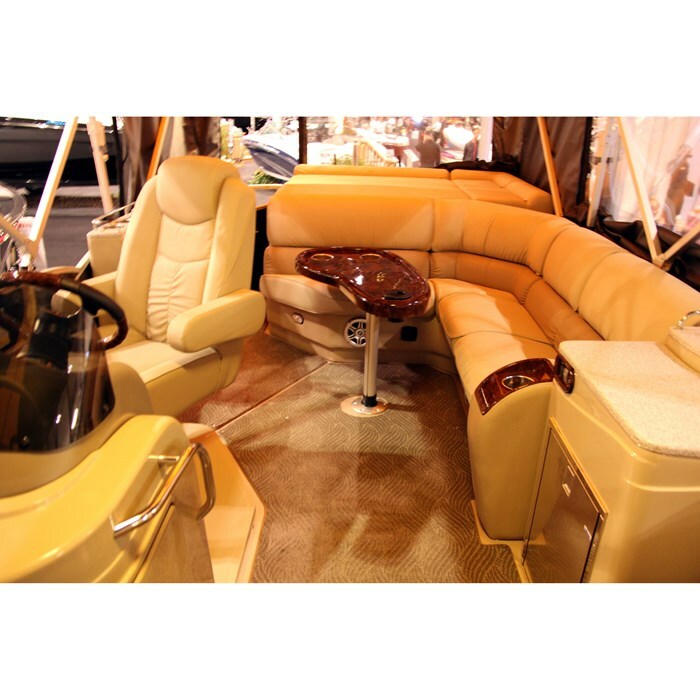 Interior layout of the Elite 326 C features a three or four-seater starboard chaise lounge style couch forward of the driver’s console with a similar facing two or three-person port side couch. On the aft port side and ahead of the “Tanning Deck” sunlounge is a four or five-person L-shaped lounge. 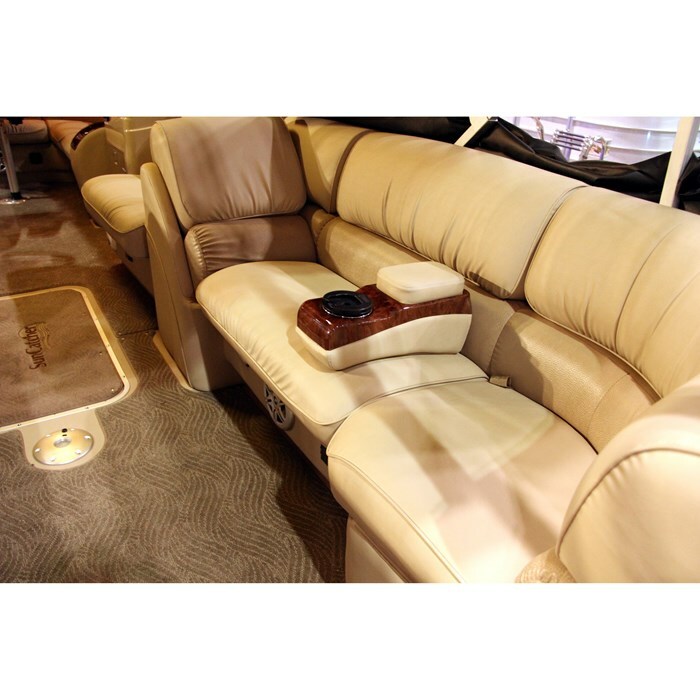 All of these lounges are constructed of composite Roto Molded material with a “Rain Drain Channel” under the cushions for dry storage and vinyl covered with TAS-1 Advanced Protection. 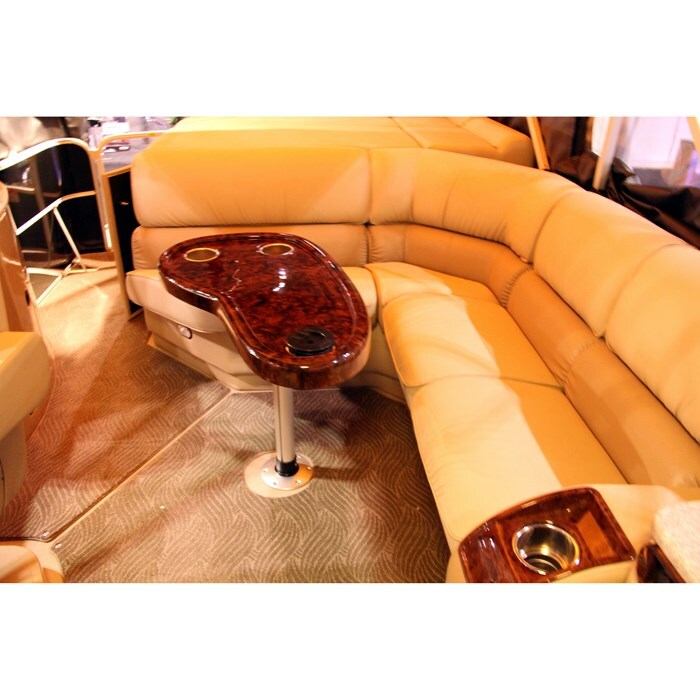 Storage compartments completely fill all areas beneath the hinged lounge cushions and even the backrests of the two bow lounges contain storage. Convenient new drop-in upper level compartmentalized trays for small items are provided to fit these under-cushion storage compartments. Vinyl flooring is standard on the Elite 326 C. In-floor storage of suitable size for watertoys is also provided within the centre log. The standard privacy enclosure is housed within the port bow lounger arm. The molded fibreglass driver’s console with tinted plexiglass windscreen and storage below comes complete with blue back lit speedo, tach, trim, fuel gauge and hour meter plus a flush-mount Garmin GPS and a Sony satellite compatible stereo with i-Pod/MP3 jack and USB port along with LED blue lit speakers. 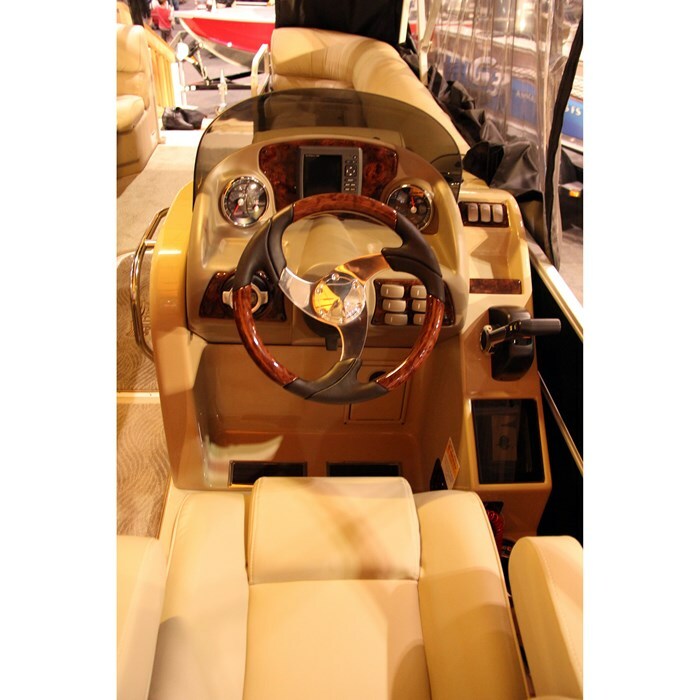 A tilt wheel and hydraulic steering is standard as is the raised platform for the helm and fully adjustable captain’s chair with armrests. 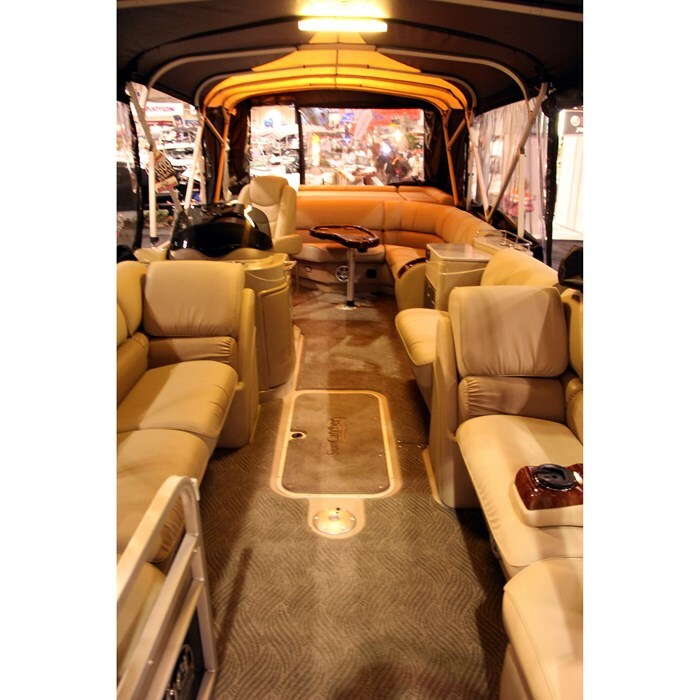 Other notable standard equipment includes a refreshment centre, ABS table with cupholders with two in-floor mounting bases, a waterski tow arch, four-step folding telescoping boarding ladder, floor level courtesy lighting, docking lights, plus blue LED cupholders, speakers, under couch rope lighting and underwater lighting. 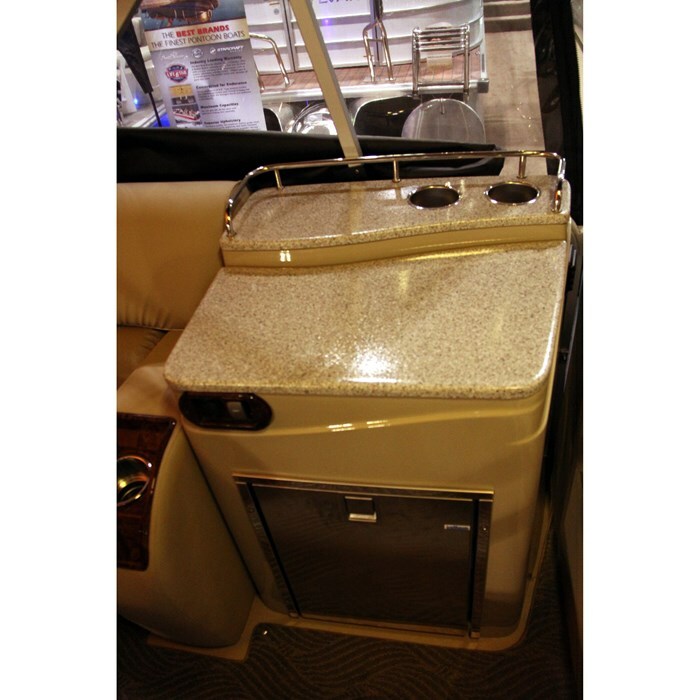 All deck rails and trim have anodizing protection. A contoured bimini top with boot is also standard as is a mooring cover. The few available options include a powder coated tandem axle trailer plus accessories, full canvas enclosure, Infinity® Seagrass mats, and a larger refreshment centre with refrigerator.